Bell’s palsy is a condition that temporarily paralyzes the side of your face. It can affect all or part of the muscles in your face. In rare cases, both sides of your face may be affected. Bell’s palsy occurs when your facial nerve (or 7th cranial nerve) is damaged. The facial nerve carries signals for movement, taste, and other information to and from your face. When this nerve is damaged, the signals between your face and brain do not work as well. While it may seem scary at the time, Bell’s palsy usually doesn’t last long. 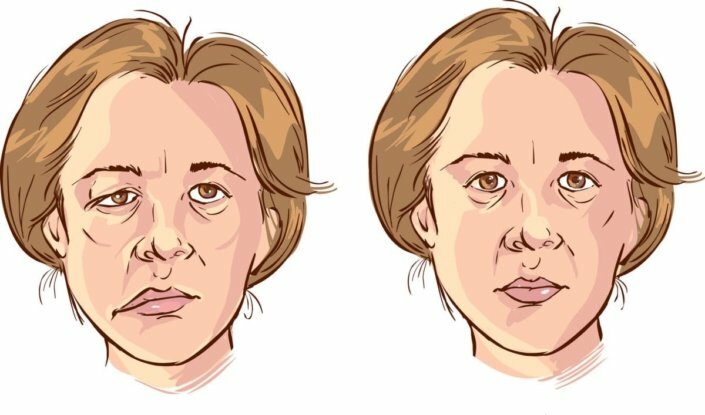 If you have Bell’s palsy, you may have some of the symptoms listed below. Drooping that makes your face look uneven. These symptoms usually affect one side of your face. They appear quickly, and reach their worst in a couple of days. All of the causes of Bell’s palsy are not known. It may occur when a virus, such as the common cold, makes your facial nerve swell. The swollen nerve presses against the bone around it. This pressure can stop the nerve from working correctly. Bell’s palsy affects about 1 in every 5,000 people. Once you have had Bell’s palsy, you have a slight chance of getting it again. There is no specific test to diagnose Bell’s palsy. Your doctor will ask questions about your symptoms and medical history. A stroke, injury, or tumor also can cause facial paralysis. Your doctor will check to see what condition is causing your symptoms. They may do tests, such as an X-ray or a magnetic resonance imaging (MRI). Can Bell’s palsy be prevented or avoided? You cannot prevent or avoid Bell’s palsy. Contact your doctor when symptoms first begin to start treatment. Bell’s palsy often goes away on its own within 1 or 2 months. Your chances of full recovery are improved with a course of steroid medicine. The doctor can prescribe this. A full course usually is 10 days. At home, you can take simple steps to help your recovery. Eat well and get plenty of rest so you can heal. Protect your eyes with sunglasses when you are outdoors. Be careful to keep your eyes moist, especially when you are working at a computer. Wearing an eye patch can help keep your eye closed at night. Apply low heat, such as a gel pack or heating pad, to help relieve pain and swelling. Gentle massage to the area may help as well. Talk to your doctor if you have severe pain. Your recovery time will depend on how badly your facial nerve is damaged. If it takes a long time to improve, you may have a few lasting effects. For example, you may have facial movements you can’t control, or your eyes may water or tear. Will Bell’s palsy go away? What medicines treat Bell’s palsy and what are the side effects? Are there exercises I can do or lifestyle changes I can make to improve symptoms? Does Bell’s palsy indicate other health conditions? If I have had Bell’s palsy, what is my risk of having it again? Is there anything I can do to prevent it? Learn about what causes problems with taste and smell, and what you can do about it. Pressure sores occur on your skin and are caused by staying in one position for too long.